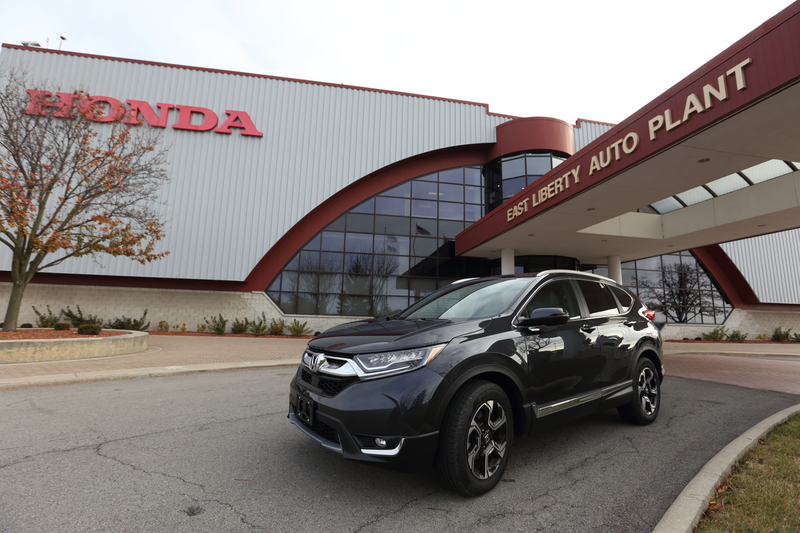 Honda today celebrated the global start of mass production for the all-new 2017 Honda CR-V at the East Liberty Auto Plant (ELP) in East Liberty, Ohio. Slated to go on sale at dealerships across North America this winter, the redesigned and reengineered 2017 CR-V is the fifth generation of Honda's immensely popular five-passenger compact SUV, the best-selling SUV in America over the past 20 years, with cumulative U.S. sales of nearly four million units since the model's introduction in 1997. As the global lead plant for this fifth-generation CRV, ELP will not only be the first plant in the world to launch the new CR-V into mass production, but has also developed the processes and technologies that will form the manufacturing base for CR-V production at ten Honda plants globally. This is the first time a Honda plant in the U.S. has led the mass production efforts for a global model. In addition to the East Liberty Plant, CR-V also will be built at Honda of Canada Mfg. in Alliston, Ont. and Honda Manufacturing of Indiana in Greensburg, Ind. In a CR-V first, the new 1.5-liter turbocharged engine is built exclusively at the Honda engine plant in Anna, Ohio. The East Liberty Plant employs 2,350 associates and has the annual capacity to manufacture 240,000 passenger cars and light trucks. The 2.8 million square foot plant started production in December 1998 and currently makes the Honda CR-V and the Acura RDX sport-utility vehicles. The plant will add production of the Acura MDX luxury 3-row SUV next year, which will be dual-sourced from ELP and from Honda Manufacturing of Alabama in Lincoln, Alabama, where it is currently built. Honda's rich history in the state of Ohio began in September 1979 with the production of motorcycles in Marysville, Ohio. In November 1982, Honda became the first Japanese automaker to begin automobile production in the U.S. at its nearby Marysville Auto Plant. Construction of an engine plant in Anna, Ohio and a second Ohio auto plant located in East Liberty quickly followed these operations. A third automotive plant, the Performance Manufacturing Center in Marysville, Ohio, started the exclusive production of the 2017 Acura NSX this year, the only supercar designed, developed and manufactured in the U.S. Located near its Ohio plants, Honda R&D Americas Ohio Center is Honda's largest R&D Center outside Japan. The facility engineers all-new products for Honda and Acura customers focused leadership in fuel efficiency and product safety. Today, Honda operates 13 companies in Ohio, producing a wide range of Honda and Acura automobiles, automobile engines and transmissions. The company has continued to expand local production, and since 1982 has manufactured over 17 million automobiles in the state. Honda began its North America operations in Los Angeles, California, in 1959. Today, Honda companies in North America represent a cumulative investment of more than $22 billion and employ more than 40,000 associates in the design, development, manufacture, marketing, financing and servicing of Honda and Acura automobiles, Honda powersports products and Honda power equipment products. Honda has been producing products in America for more than 37 years and currently operates 19 major manufacturing facilities in North America. Honda also operates 14 major research and development centers in the U.S. with the capacity to fully design, develop and engineer many of the products Honda produces in North America. In 2015, more than 99 percent of all Honda and Acura automobiles sold in the U.S. were made in North America, using domestic and globally sourced parts. 1. Honda products are built using domestic and globally sourced parts. (The 2015 CY reference embedded later in the release does not cover current production of CR-V or other post 15 CY production). Launch of All-New Honda Talon Side-by-Side Highlights Growth, Enhanced Capabilities at Honda of South Carolina Mfg. The Honda Government Relations office in Washington D.C. works to advance Honda&apos;s interests in the U.S. by highlighting Honda&apos;s economic investment and employment history in America along with the company&apos;s efforts to enhance the fuel efficiency of its products, develop advanced safety technology, and deliver top-level quality to customers.